718 parks, 436 playgrounds, 614 sports clubs. This is Essen. Essen is the perfect holiday destination. The third-greenest city in Germany is a great place to unwind - 365 days a year. 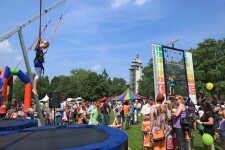 The Grugapark - the green heart of Essen – combines flora, fauna and public art. About eight kilometres of water and a 14 kilometre circuit make Lake Baldeney one of the most popular recreation areas in the city. Water sports enthusiasts as well as cyclists, inline skaters and walkers will all find what they want here. A bike will give you the ideal opportunity to discover the greenest city in North Rhine-Westphalia. This is thanks to the well-designed 300km network of cycle paths, most of which run along disused railway lines. ESSEN. The most beautiful place to spend your leisure time. Detailed information about the Essen sports and leisure scene is available online on the City of Essen’s leisure portal. Not a natural lake – but still a real piece of home for Essen natives. Or even better: a nice taste of that holiday spirit. Right at your doorstep. For cycling enthusiasts, sailors, strollers and families. Including a beach bar with palm trees and the White Fleet. Beach lounger or promenade deck: on Baldeneysee you can have both. The “White Fleet” operates between April and October, offering round trips on Essen’s home pond that call at a total of five points between Kupferdreh and Stauwehr, or a longer-distance cruise on the Ruhr to neighbouring Mülheim. In addition to the scheduled services, special excursions are available. The former “Freibad Baldeney” open-air swimming pool, which opened in 1937, is in a unique scenic location right on the banks of Lake Baldeney. 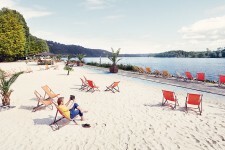 It has been leased to Seaside Beach Baldeney GmbH since 2005. Today, the Seaside Beach takes its guests on a mini-holiday with its “Caribbean flair”. The green heart of the city with lawns, themed gardens, playgrounds, a petting zoo and a free-flight area. Once a year in winter, visitors can experience wonderful light art - the "Parkleuchten" - as darkness falls. This hands-on sensory experience takes centre stage in the protected former hoisting machine hall. At 120 experimental stations, visitors of all age groups can play around generating and observing the phenomena of sound, light and movement. Once the most productive hard coal mine in Europe, today it is home to museums for dance, performance, theatre and design, as well as the most important venues of the ExtraSchicht, and welcomes around 1.5 million visitors from home and abroad every year. It is regarded as a symbol of the area’s successful transition from an industrial hub to an attractive cultural, leisure and business location. Visitors can explore the past and the present on these grounds, either on their own or as part of a guided tour, e.g. on the ZOLLVEREIN® monument trail. Diverse, green and absolutely worth a visit – this is Essen. The region has long been dominated by industry. Today, industrial heritage is the main unique tourist feature of the city and the region as a whole. And what better way to discover this than on a bike or e-bike? Discover Essen on two wheels! Click here for more information about Essen.By bike. From the Emscher Valley into the Ruhr Valley - nature and urban development can best be experienced with the NaturLinie 105. The NaturLinie 105 is one of EVAG's scheduled routes and you can get on or off at every stop. You can buy tickets at the ticket vending machines, in the customer centre, at our sales outlets or as a smartphone ticket. This tour in a brand new double-decker open-top bus will show you how Essen transformed itself from a centre of the coal and steel industry to a modern business, commerce and service metropolis in the heart of the Ruhr region. The trips are organised by Ruhrgebiet Stadtrundfahrten c/o Münsteraner Stadtrundfahrten GmbH. Enjoy discovery Essen - European Green Capital 2017! Whether you are visiting alone or in a group, for one, two or three days, the ESSEN WelcomeCard is packed with benefits from 54 partners in the arts, culture, leisure, gastronomy, hotels and shopping. To cap it all, the ESSEN.WelcomeCard. allows free travel on public transport within the Essen city limits for the duration of its validity. Click here for more information about the "ESSEN WelcomeCard"